We are kindred spirits, you and me. Staying organized, finding joy in crossing off to-dos, always thinking of the next step. As a type-A kind of girl, I fully support lists and all the planning they bring. However...I'm going to let you in on a little secret. Sometimes it's okay to throw the list out. ...Read the rest of my post today over on the love letter blog! 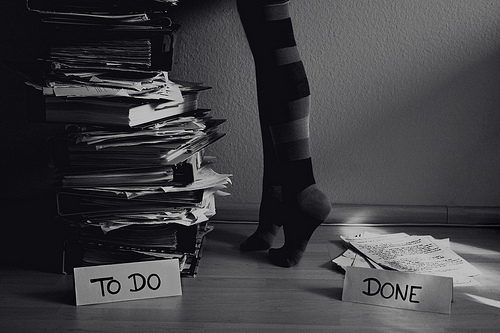 Oh my gosh - that pile on the left...I literally do have a To Do list that tall, that I can never seem to get done. Ugh! I initially thought that photo was a sonogram. Almost fell off my chair! You know that I am a big fan of throwing out the list! Only, I don't usually get to throw it out, I almost always lose it first. =) Love you.